Combine chili paste, soy sauce, lime juice, 1 tsp of the sesame oil in a bowl and whisk well. Add chicken breasts to the mixture in the bowl and toss to coat evenly. Cover and refrigerate for 30 minutes to 1 hour. Combine mayonnaise, lime zest, lime juice and ½ tsp of sesame oil. Set aside. Preheat grill pan (BBQ or sauté pan) to medium. Cook the chicken for 10 minutes per side, or until cooked through. Set aside and keep warm. In a medium bowl, combine shredded cabbage, shredded carrot, cilantro and red chili. Add all but 2 Tbsp of the mayo mixture to the slaw and toss to combine. Spread one half of each bun with half of the remaining mayo mixture. 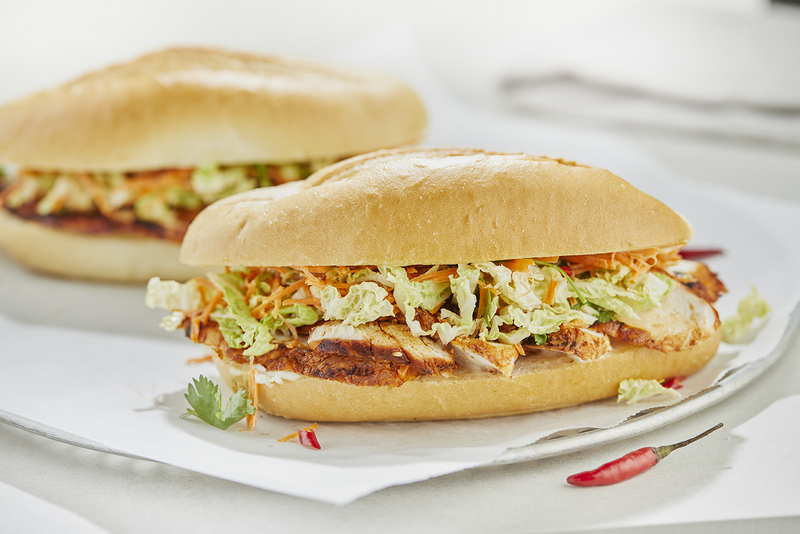 Top with a chicken breast and a generous amount of the slaw. Serve with lime wedges and extra slaw on the side. Tip: recipe can easily be doubled.